The Solar Energy Industries Association (SEIA) and Vote Solar have revealed the top commercial solar users in the United States, and you may be surprised at some of the companies on top of the list. The companies are ranked by cumulative solar energy capacity, which means big companies automatically have an advantage above those with fewer facilities around the country, but it’s still an interesting list. According to SEIA and Vote Solar, these 20 companies generate roughly $47.3 million worth of electricity every year, saving these businesses hundreds of millions of dollars. More than 1.2 million solar PV panels were used for these installations, which if combined, would cover over 544 acres of rooftops. There are several other companies getting serious with solar that didn’t make the top 20 such as Apple, Google, REI, and Tiffany and CO. It’s no secret that solar power is on the rise and becoming a lot more affordable, meaning it won’t be long before the competition among companies gets much more serious. Are you surprised at the top 20 solar power users, or is it along the lines of what you expected? 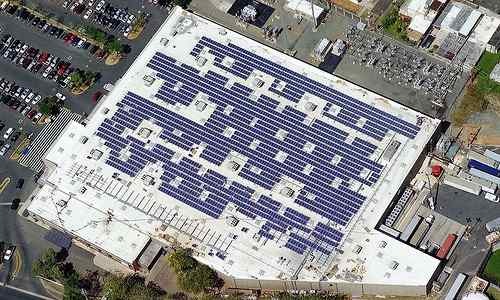 Image CC licensed by Walmart: Huge solar panel installation on the roof of a Walmart outlet. Next post: Climate Change Will Transform The Australian Bush: How To Cope?